12th June 09 - 16th June 2009 at Pacific Place in the centre. 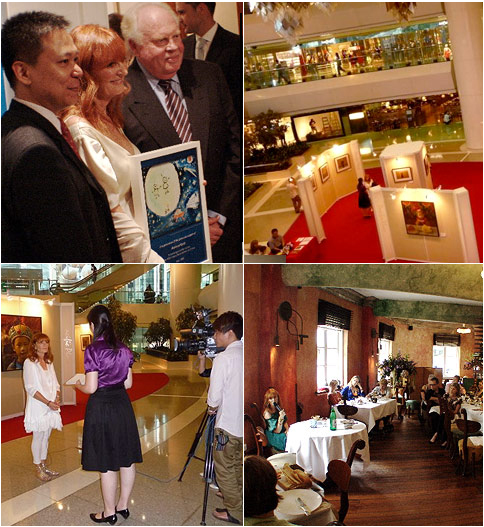 The Australian Consulate Gavin McDougal in Hong Kong, together with Paula Rankin and Alethea organised this exhibition. It was sponsored by The Australian Consulate-General Hong Kong, Grand Hyatt Hong Kong, Pacific Place (Swire), Chi Heng Foundation and Qantas. It could not have been done without help from volunteers Paula Rankin and Leroy who tirelessly helped out at the exhibition every day. The exhibition was a success, generating much media coverage. All the proceeds from this exhibition were donated to the Chi Heng Foundation, to help the children in Henan and Anui in Central China who are from Aids affected families. Alethea also gave a 55 min talk at the "M on the Fringe" restaurant which had the audience in tears and laughter. M on the Fringe donated all the money from lunch to Chi Heng Foundation.